This is not the first time, nor would I think it would be the last time, but I think I need to do something about S.B. Gobbinathan stealing my content for his blog. 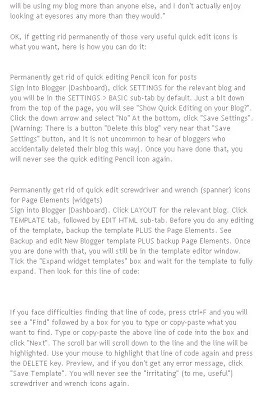 Let us have some screen shots of my post Remove "pencil" and "screwdriver and wrench (spanner)" quick edit icons (click BACK button to get back to this page). Unfortunately, S.B. Gobbinathan either do not know how to format his template properly or was too lazy to do so, for the date is not visible, but his blog only started in 2008. <Variable name="colorenlaceencima" description="Hover Link Color"
<Variable name="colortituloblog" description="Blog Title Color"
<Variable name="descripcioncolor" description="Blog Description Color"
<Variable name="colortituloentrada" description="Post Title Color"
<Variable name="colortituloslateral" description="Sidebar Title Color"
<Variable name="colortextolateral" description="Sidebar Text Color"
<Variable name="colortituloslateral2" description="Sidebar Title Color Right"
<Variable name="colortextolateral2" description="Sidebar Text Color Right"
<a href="http://www.SearchEngineOptimising.com"><img border="0" width="100" src="http://www.searchengineoptimising.com/urlsubmission.gif"
"An Internet troll, or simply troll in Internet slang, is someone who posts controversial and usually irrelevant or off-topic messages in an online community, such as an online discussion forum, with the intention of baiting other users into an emotional response or to generally disrupt normal on-topic discussion." True or not I do not know and have no time to check. If true, S.B. Gobbinathan should know he is under watch. Now I am going to contact S.B. Gobbinathan regarding this copy-paste post of his. I just had the same thing happen and wrote a post about it. I'm giving her a chance to take it down before i do anything drastic...I'm seething!! I sincerely apologies, for the mistake happened, this http://bloggerszpot.blogspot.com blog was not under my control, since I was new to blog and I don’t have much knowledge about the blogs, I have given rights my friend to do some posting on it. I was not aware of where he has taken those posting. Anyway at end of the day I am responsible for the mistake happened. Sad to see a blogger go, but all of us make our own decisions and there is no compulsion. As for not being a copier, the proof are all in the post, the screen shots, the page source. You cannot run away from that. 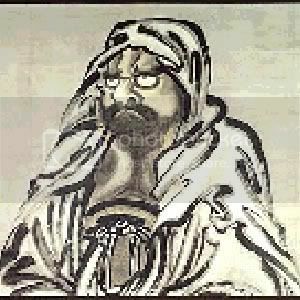 Perhaps it is better to admit one's faults or mistakes, correct it, don't repeat it again and move on. For after all, one of the greatest teacher of good things, Jesus, taught forgiveness, and even doctors agree, when one keep unforgiveness in one's heart, it is more harmful to oneself than to the other. So my suggestion to you is, if you do intend to blog, by all means continue. But don't repeat past mistakes. I will visit your blog if you have made your profile and blog or blogs public and see what you have posted. Whatever it is, hope you picked up some pointers as to how to deal with situations like these and you may get more from What to do when your content is copied. It's even worse, some thieves can even setup a script to copy stuff from other blogs on a regular basis, so he doesn't even have to cut and paste. Next time this happens, Send him an invoice!. And try to have Google block is service due violation of the TOS. I'm sure there's something in there about "copyright infringement". PS: This is my first post here, I've just discovered your blog. Are you, by any chance, aware of any way to add a "footer" to a Blogger blog using one of the default templates?. i'd like to have a random quote or footnote, but I'm clueless on how to do it. Thanks. How's things ? What happened to your posts ? No posts since April - you getting lazy, like me ! Hope you are not as old as me. Want to know how old I am and also perhaps some reading material, follow a link in my Profile (About Me) and note the age in the individual post page or permalink as I got a bit groggy and edited the post title but have no time to edit it back. OK OK, you took all the trouble to check all the blogs and found the latest updates were Will start approving and responding to your comments soon and Late responses: Apologies and reasons but the other blogs are also not frequently updated. But quite a bit of my time is spend moderating a Blogger related group I inherited (didn't create): Blogger General Discussion, comments and emails. 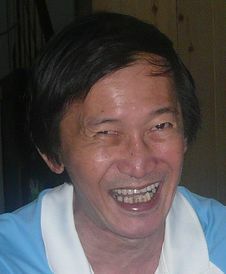 I unfortunately ended up as a jack-of-all-trade but with wide general knowledge and have numerous blogs including Environmental blog: Enviroman Says, Lewis Chew, youngest "blogger" in the world? and many other blogs with all kinds of different templates. I was actually a bit lazy because this response was actually started earlier, then went to rest for quite a while, and now I am back. Anyway hopefully have given you sufficient reading material for the time being, if not, please ask for more but if only Blogger related stuff you want, make it known. "Serious" and "not sarcastic". Stating it because sometimes people misunderstand me, a harmless fellow. Main Page, individual post pages (permalinks), archive pages, label pages. Hope that will clarify this thing called page. "Are you, by any chance, aware of any way to add a "footer" to a Blogger blog using one of the default templates?." 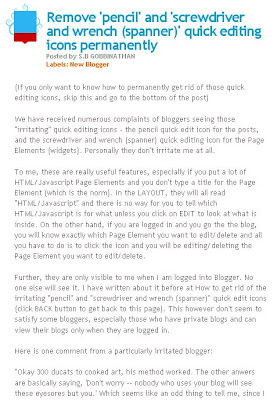 Please refer to Footer for blog: Methods. "I've just discovered your blog." Mind telling us how you found this blog? Search Engine? Forum? A link? Bad Content? Who will want to visit the blog? ONE DOUBT,IS ADSCENE IS RISK?,BECAUSE U HAVE SOURCE CODE AND ID OF S.B GOBINATH,THAT MEANS ANY USER CAN HAVE ANOTHER USERS ID AND SOURCE CODE. AS IAM NEW TO BLOGGER.BUT IAM MUCH INTERSETED IN BLOGGING,AS YOU CAN SEE MY BLOG. I MADE IT FOR SOCIAL WORK. AND HAVE AN INTENSION TO CREATE A WEBSITE OF MY OWN. HELP ME!!. It is OK to have AdSense in your blog as long as you don't do anything. I have mine for years without problems. What you can do is to keep watch on your account and report to AdSense if you see any suspicious activities.